S. aureus infections in intensive care units in the National Nosocomial Infections Surveillance System. 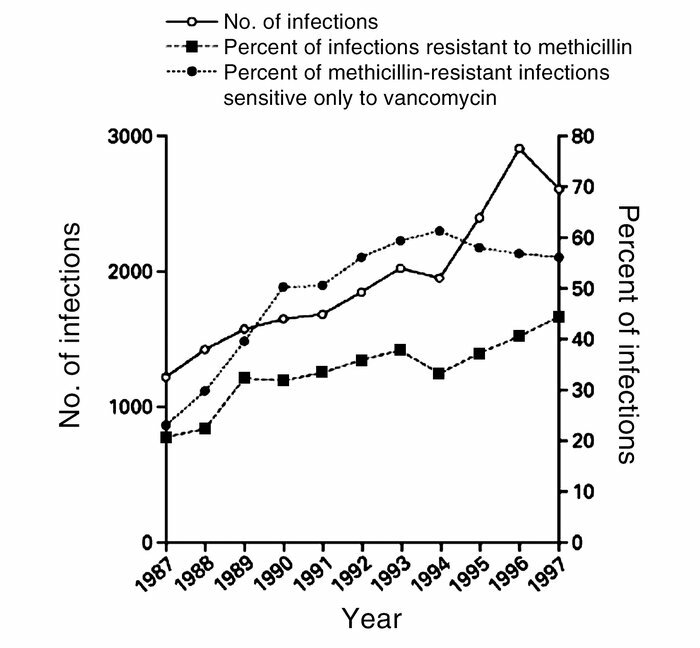 Data include the total number of infections from 1987 to 1997. Isolates were tested for sensitivity to the following antimicrobial agents: gentamicin, tobramycin, amikacin, ciprofloxacin, clindamycin, erythromycin, chloramphenicol, trimethoprim-sulfamethoxazole, and vancomycin. Some hospitals did not test for all of the antibiotics. Reproduced with permission from New England Journal of Medicine (4).